Rogovin’s lens has illuminated prominent social issues over 50 years, highlighting the plight of the miner in ten nations, the decline of the steel industry in Buffalo, NY, and a three decades long focus on family’s in the city’s Lower West Side. Many photos celebrate the spirit in Buffalo’s storefront churches. Rogovin’s camera takes the viewer on a visual journey into the workplace and into workers’ homes, conveying the beauty of struggle and the dignity and strength of ordinary working people as well as the realities of poverty. Rogovin’s son, Mark, talked with the World about his father’s 1967 trip to Chile and his correspondence with the world renowned poet Pablo Neruda. After sending letters and photographs, Rogovin finally contacted the famous Chilean poet. “Come immediately,” said Neruda. Six weeks later Rogovin showed up at his door, cameras in hand. Neruda suggested that Rogovin travel to Chiloé, Chile, one of the world’s biggest islands, where he spent a month documenting the daily lives of people in the towns of Quemchi and Castro. Mark Rogovin said his family always wondered about the people in the photographs. That interest led to Milton Rogovin’s daughter Ellen Rogovin Hart’s 2004 encounter with Carlos Trujillo, a poet and professor in the Spanish department at Villanova University in Havertown, Pa.
Trujillo is originally from Castro, Chiloé in Chile and grew up where the photos were taken. He wanted to help locate the people in some of Rogovin’s most memorable photographs. A librarian and filmmaker from Chiloé responded to Trujillo’s request for help. In January, after locating some of the people in the photographs, Mark Rogovin and his sister, Ellen Rogovin Hart, traveled to Chiloé to meet them during an exhibit of their father’s photography at the Museo de Arte Moderno Chiloé. “Nada Queda Atras,” or “Nothing Left Behind,” a new book with 40 of Rogovin’s Chiloé photos and 40 poems by Trujillo, was released during their visit. The limited edition book was supported by the museum and partly funded by the Chilean government. A search is underway to find a publisher for an English or bilingual edition. “Because Trujillo was born and raised in Chiloé it allowed the poems that he wrote to have more depth and understanding in connection with my father’s photographs,” Mark Rogovin said. One of the most striking pictures was of a mother named Silvia and her child. “Since 1967 we have been wondering who this woman was, what work she did and more about her life,” Mark Rogovin said. As the two were driving to meet her, Ellen Rogovin shouted out “That’s Silvia!” During an emotional reunion, they learned Silvia’s daughter had since died, and the mother had no pictures of her. Rogovin’s photo offered the mother a memory she thought she had lost forever. Though Silvia speaks no English, they put her and Milton Rogovin on the phone together. “More than anything else, they were in tears,” Mark Rogovin said. 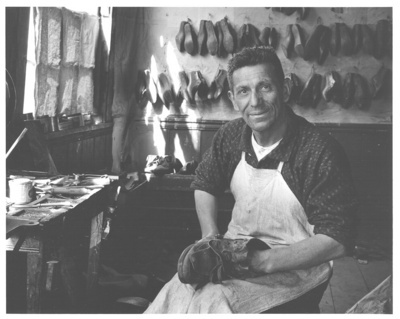 Another brilliant picture is that of a communist shoemaker who has since passed away. “We met his daughter who just retired from teaching,” Mark Rogovin said. The shoemaker’s daughter told of the time Neruda autographed a book of his poems to her family. During the Pinochet military dictatorship, the family tore out that page and burned it, fearing the cruel penalties imposed on those who associated with communists. Many projects related to the trip are underway, including a slide show about the Rogovin family meeting Carlos Trujillo to better understand the different connections and relationships. A Chilean filmmaker hopes to travel to the U.S. to present interviews with the people and families in Rogovin’s photos. Today 20,000 pieces of Rogovin’s correspondence including negatives, contact sheets and 13,000 master photographs are housed at the Library of Congress in Washington, D.C. Brother and sister are currently organizing their father’s collection and have worked on numerous projects including developing books and films about his work. Upon their return to the U.S. Milton Rogovin expressed happiness that his grown children could join the festivities in Chile. As curator of his father’s photography, Mark Rogovin said, his aim is for the photographs to be seen, enjoyed and used in schools and many other ways. They are on display at www.miltonrogovin.com. “What happened in Chile was definitely the best project coming out of his photography so far,” said Mark Rogovin.